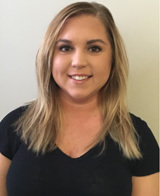 Contact us today to schedule your appointment with Amie, our Licensed Massage Therapist. We even have special offers and pricing for your first scheduled massage. Amie graduated from the Lancaster school of Cosmetology and Therapeutic Bodywork where she earned a license in Massage Therapy (Liscense #MSG010913). She believes in the body’s ability to be able to heal itself and utilizes her expertise to assist in this process. She uses an integrative approach specializing in deep tissue, orthopedic, Swedish, reflexology, pre-natal massage, myofascial release and acupressure.